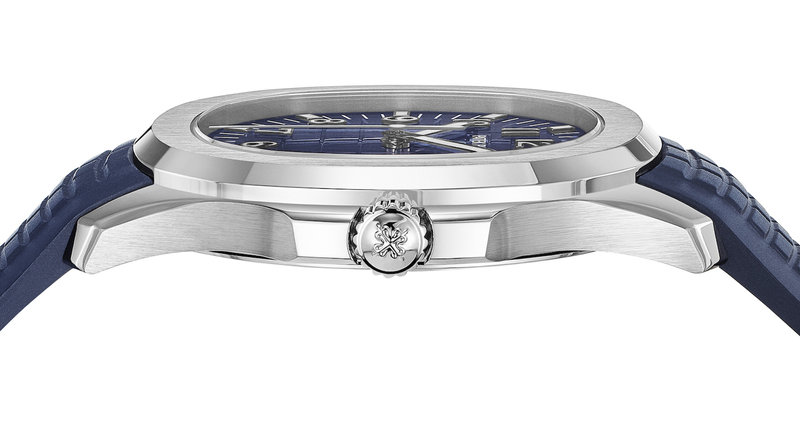 Last year Patek Philippe celebrated the 40th anniversary of their iconic Nautilus collection. 2017 is all about the more dynamic Aquanaut that celebrates 20 years since its introduction in Basel in 1997. Let’s take a look at the Patek Philippe Aquanaut Ref. 5168G. 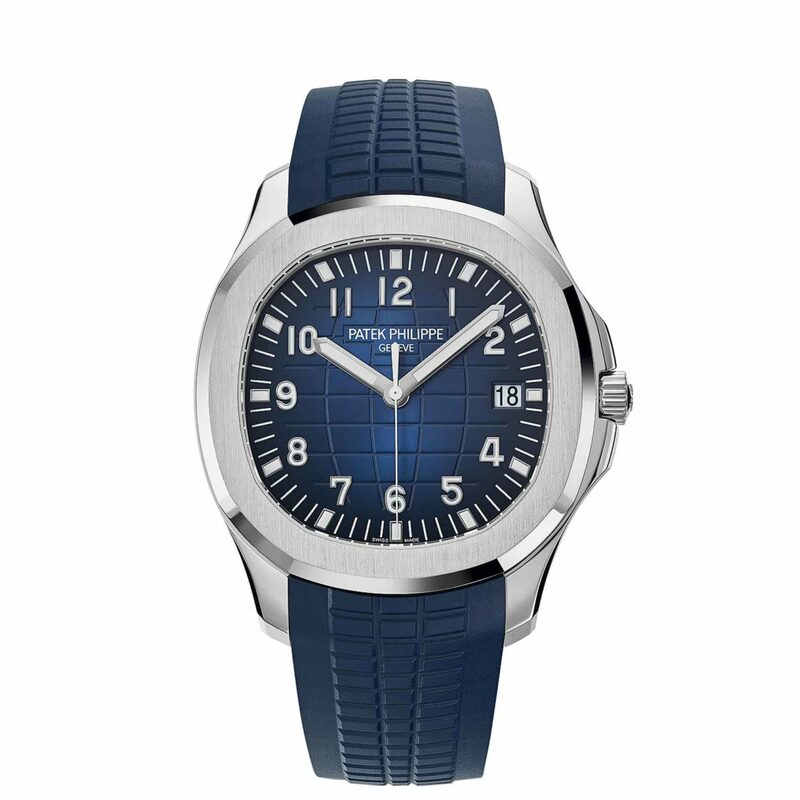 The Patek Philippe Aquanaut was made as a contemporary watch for men. The stainless steel model aims at a younger generation of watch aficionado’s. So, if you couldn’t afford a Nautilus, this was the next best thing. 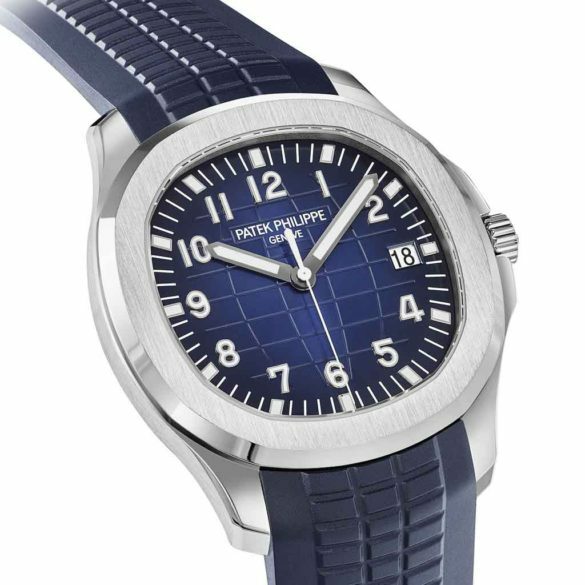 They even successfully introduced a women’s version in 2004, the Patek Philippe Aquanaut Luce (reference 5067). 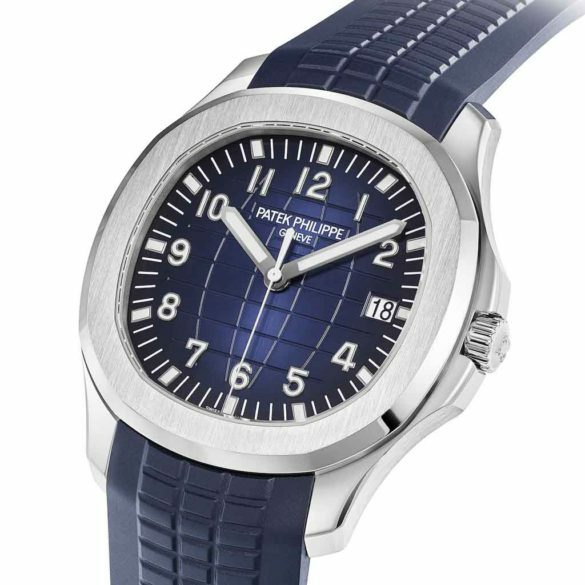 The new Patek Philippe Aquanaut Ref. 5168G honors the anniversary with an 18-carat white gold case, a stylish midnight blue dial and a dark blue composite strap. The design of the gently rounded octagonal bezel with vertically satin-finished flats and chamfered polished flanks remains unchanged. Moreover, with a diameter of 42 millimeters, it is the largest model in this line. The Aquanaut Ref. 5168G is powered by the trusty caliber 324 S C. Merely 3.3 millimeters in height, the movement is so flat that even with its elaborate seals and gaskets, the complete watch is still only 8.25 millimeters thick overall. Not that Patek has cut any corners with the caliber. With its heavy central rotor in 21-carat gold, it extracts and stores energy from every movement of the wrist and features a rate accuracy of -3 to +2 seconds per day as specified by the directives of the Patek Philippe Seal. The finishing of the movement, visible through the sapphire crystal case back, is fascinating to say the least. But on the other hand, this is to be expected of Patek. A pity that Patek Philippe did not choose for an updated caliber for the anniversary model. The movement looks beautiful, but is perhaps a tad too small for such a big case. A 40-millimeter case would have suited the Aquanaut Ref. 5168G a bit better.